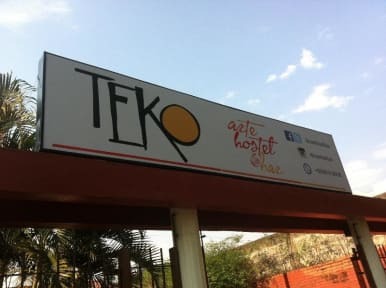 Teko Arte it's a new hostel in Ciudad del Este, Paraguay, is near by lots of restaurants and bars and 10 min walking to downtown, located in a safety neighborhood, privileged area 200 mts to the Lago de la Republica, a place where people spend time to exercise and just walk around. 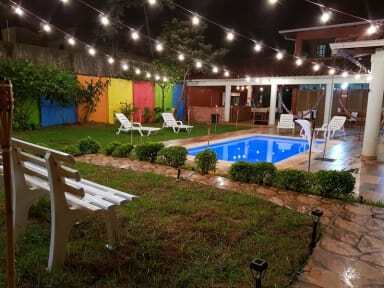 Located at Barrio Boqueron, Ciudad del Este, Paraguay, near by the Lago de la Republica, and 15 min walking to downtown, 10 min walking from the Bus Station. We are located 20 min walking to the border with Foz de Iguaçu, Brasil 600 mts to all the bus lines. The neighborhood is growing around great bars, restaurants, and dancing places. The hostel has common TV area, community kitchen, a nice patio with a bbq area, paraguayan hammocks, and a nice swimming pool. Very nice place for stay . Nice hostel, friendly owners. Walked about 40 minutes from the bridge border with Brazil. It's also 20 minutes from the bus station for Asuncion. Clean place, decent breakfast, only stayed one night. Good value for the money. Also got good tips for the bus from the owner (Gracias!). Made to feel very welcome at the Hostel - the owner went out of her way to answer many questions & gave lots of information - thank you :-) . Very clean hostel & was made to feel at home. The owner is a really nice lady who has lots of information for you if you ask. She was very informative and made the stay more interesting. A nice hostel but fairly overpriced for what you get. Overall, it is a decent place to stay and it is well located. Easy short walk from bus terminal and comfortable walk to the shopping area. The staff was helpful and friendly but not always easily found. I think it could be a great place, but I am not sure the owners are committed to making it the success it could be. Cleanliness does not appear to be a major concern nor does upkeep of the facility. The hostel was in a good location, not far from the bus station, quiet and safe. We would have appreciated lockers and a slightly cleaner place. The first night was pretty good, but the second day we saw cockroaches. The staff was helpful and the atmosphere is nice with a small pool and a bar; however there were only three guests the second night. This hostel gave a bad impression from the beginning. We had to put linens on the beds ourselves, the dorm rooms are in shambles (plaster falling off the walls), nowhere to hang things and we were in a 10 bed dorm despite it advertised as an 8 bed dorm. The hostel was also not very clean (dusty, dirty pool, dead bugs in the shower). They have a cleaning person but it seems they only come once a week. The breakfast was toast and coffee only. I don’t highly recommend this place. Place is really run down everywhere. Kitchen almost unusable. I saw the cleaning lady, yet our bathroom does not look like it has been cleaned in the last week or two at all. Missing a lock and some possibility to hang stuff as well. No lockers in the dorm. The AC doesn't do much about the heat and you essentially got no WiFi reception in the bigger dorm. Expensive price, especially for what you get, because apparently the only hostel in town.